Cycling Skills: Speed, Leg Speed, and "Spinning Out"
Cyclists sometimes refer to “spinning out” in a sprint or down a hill, meaning they feel they reached the maximum speed they could in the gears they have. The implication is that with a bigger gear they could have gone faster in the same scenario. However, fitness and skill development (or lack thereof) are the limiting factors long before gear selection. Leg speed is a skill that juniors are forced to develop due to junior gears (Huugh! Sorry, I just threw up in my mouth a little bit. That happens when I think about junior gears.) Track riders also develop this skill due to riding a fixed gear. And it’s a skill that all riders should work to develop through high cadence workouts. Accelerating out of turns, jumping, attacking, and sprinting will all improve if a rider is simply comfortable using higher leg speed (100–150). At the end of the day, your top speed is limited by power—800 watts in a 53 x 12 is the same speed as 800 watts in a 53 x 14. But developing leg speed so your muscles will perform well at high RPMs can help you put all of your available force into the pedals, ultimately producing more power. Power aside, let’s just look at the myth of spinning out. Not many riders are hitting 40 mph in a sprint. 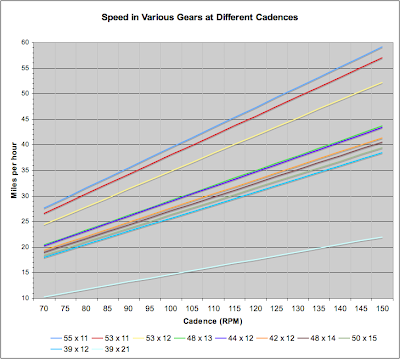 Never the less, it’s possible to reach that speed in nearly any set of gears whether you throw on a monster 55 chainring or you’re limited to junior gears (roughly a 48x13). As you can see in the chart below (click to enlarge/zoom), the absurdly large 55 x 11 requires a cadence of just over 100 to do 40 mph. Juniors can keep pace with a cadence of about 138. On the track, pursuit riders use a cadence of about 120, kilo riders are around 140, and track sprinters are over 150. This isn’t the cadence you want to hold for an hour, but for accelerating out of corners, sprinting, or descents of a few minutes, the stock 53 x 12 on most bikes is more than enough. If you can’t hold 140 RPMs for the duration of a sprint, or 120 for at least 10 minutes, it’s time to add some high cadence drills to your workouts so you’re capable of it and become more comfortable maintaining this tempo. So next time you hear a rider say he’d “spun out,” what he really just said is, “I can’t go that fast,” or “I’m lacking leg speed.” The chart doesn’t lie, and any rider should be able to put out 140 RPMs for a 10-15 second effort. Few riders have the power to turn the pedals at 140 RPMs in their biggest gear, but if you did you’d hit nearly 48 mph on a 53 x 12 and just over 40 on junior gears. Those are speeds that can win a lot of races. This is definitely the truth, Lucas. Lately, I've been doing a lot of spinups and speed drills, because I know I'll need them if I ever want to contest a sprint!